With some trepidation I introduce a page on wholly fictional locomotives. I don't want anyone thinking that the other Unusual Locomotive exhibits are anything other than real, or, in a few cases, serious projects. However, the imaginary designs here are so bizarre that I think they deserve a little exposure. This somewhat less-than-plausible design was described by "Eli Gilderfluke" in the American journal Railway Gazette, 6 Dec 1931. Possibly it was some sort of Xmas humour feature. The actual author is unknown. "1: A high-power triple X-ray electric searchlight of 9340 candlepower, to enable the driver to see round curves and through mountains." "3: A new, and vastly improved, smoke-pipe or "carbowallop" for the swift conveyance of smoke, cinders and gases back to the firebox for reincineration." "17, 18, 19: are steam cylinders forming a trunk cross-steeple-tandem-compound system of such marked economy as to effect a proved saving of 87.8% over the steam consumption of the best designs of the highest type of simple engines... Improvements now making will show a still further economy in the steam consumption of 12.2 %..."
"The inventor stands ready to demonstrate the economies of this engine, on any kind of paper, either with pen and ink or with a soft lead pencil with a rubber tip." It would be churlish to underline the impracticability of the above monstrosity, but I am a churl so I will do it anyway. The middle driving wheels (53, 57) are coupled with a rod to the lower driving wheels (54,56) but since these mesh like gears they would rotate in opposite directions, so one is reluctantly forced to conclude that this tour-de-force of locomotive virtuosity... is going nowhere. 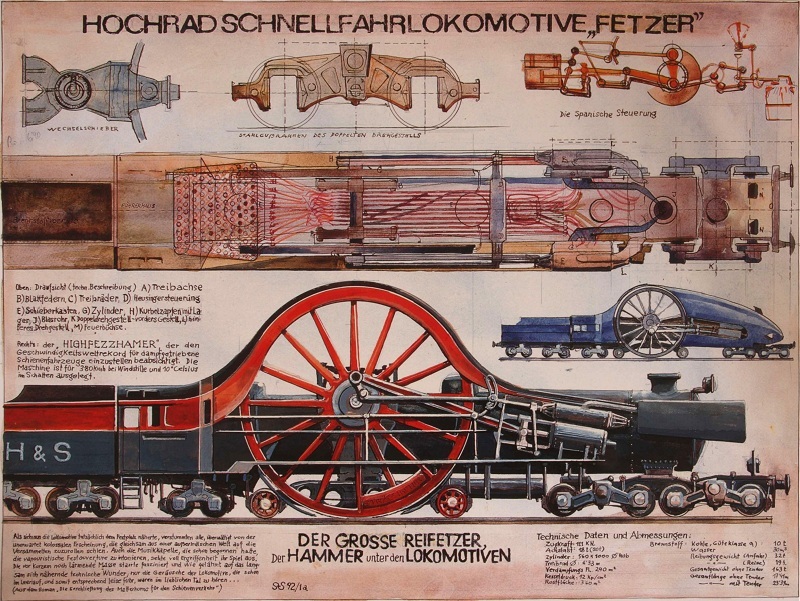 I first came across these remarkable drawings by Sigi Strasser in the railway section of the Vienna Technology Museum (a truly wonderful place) Lorenzo Ricotti has done an impressive amount of research, and I am glad to report that Sigi (short for Siegfried) is alive and well. Sigi Strasser was born in 1929 and is an Alumnus of the Linz Arts School (currently Linz Arts University), and has been since 1964 active as independent artist. He describes his artistic stance as "off the beaten track of tradition and modernity". His most important individual exhibitions took place in Hamburg, Mannheim, Milan, Turin, Vienna and New York. Mr Strasser is retired but is currently organising an exhibition of his ideas for gradient-climbing locomotives in Switzerland this summer. He has sent Lorenzo Ricotti some more of his drawings that are not in the Vienna museum, and these will be added to this page. This monstrosity also appears to have been inspired by The Holman Horror, but Mr Strasser has gone one better; here there are four layers of wheels. The text reads: "the new way to gain speed without haste". Perhaps some sort of reference to the English proverb "More haste less speed". Picture in Vienna Technology Museum. Author's photo. Translation kindly provided by Roland R�pnack. 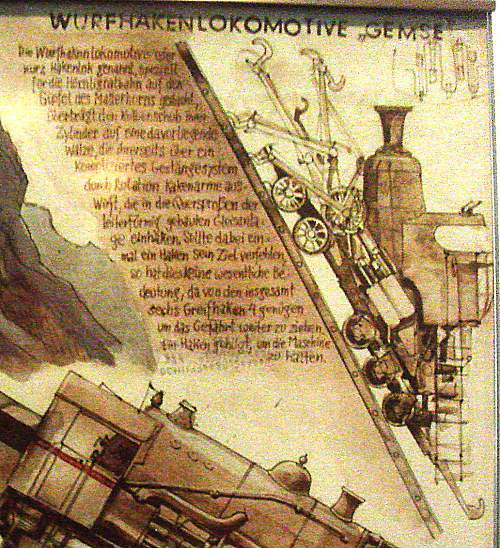 There is of course nothing fictional about rack locomotives climbing very steep gradients. The Pilatus railway in Switzerland is the steepest in the world; it opened in June 1889 with steam operation. The gradient is 48% maximum and 38% average.The maximum gradient of 48% meant that none of the existing rack systems were up to the job, and the line's engineer, Eduard Locher, developed a rack system specifically for this line. In the Locher system, the cog wheels on the train are mounted on vertical axles and their teeth engage with gear teeth cut in the sides, rather than the top, of the rack rail. This one is apparently intended to work on level track as well. 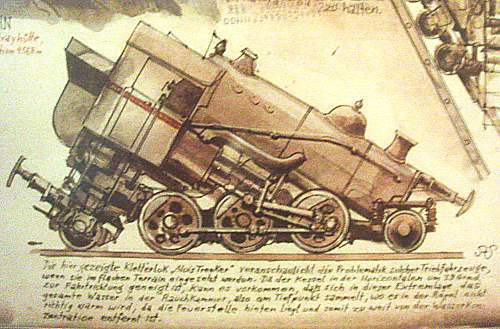 "The climbing loco "Alois Trenker" shown hereby visualises the problem of such locomotives when used in flat terrain. Because the boiler is tilted 34 degrees to the driving level in horizontal direction, it may happen in this extremal position that all the water is collecting in the smoke chamber, the lowest point, where it will not heat up enough, because the fireplace is positioned in the back and too far away from the water concentration." "Indeed this problem is the reason for the tilting of steam cog locos on big gradients. Strasser does not mention the danger of overheating when the fire chamber is not surrounded by water, though. Alois Trenker was a famous actor starring in numberous sentimental movies which show a pastoral mountain world full of backward ideology." Grappling hook engine "Chamois" (This alpine goat is famous for its climbing abilities) The grappling hook locomotion, in short hook loco, designated expecially to the H�rnligrat railway to the Matterhorn peak, transfers the piston pull of the cylinders to a roller in front, which itself throws out three grappling hook booms by means of rotation via a complicated system of levers and rods, which link into the cross beams of the ladder-shaped constructed track system. Should a hook ever miss its goal, this is of no significant importance, because four of six grappling hooks are enough to still push the vehicle forward. One hook is enough to hold the engine. These specialised locomotives were allegedly sent to any town in pressing need of a monument. Note the clever use of the vertical boiler format. "There are many smaller or bigger townships lacking decorative monuments. If such a town has the occasion to use one or more of such monuments, the appropriate monuments are sent via railway. A connection line must exist, though. Here we see Kaiser Franz Josef, Emperor of Austria, together with two allegorical figures Eros and Fondness." This locomotive is a bit of mystery. 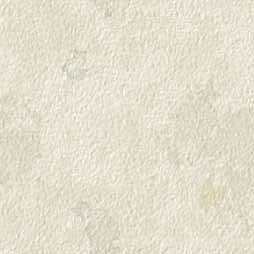 It appears the tidal forces of the moon are in some way claimed to equal out the tractive effort. It has a unique 0-16-0 wheel arrangement which is one in the eye for Stalin. Since the cranks are bigger than the wheels, the rails have to be raised to let the cranks clear the ground. What was this man smoking? "With every full turn of its machine the Quartemperon only covers a distance of a quarter wheel turn, so the tractive output on a gradient of +/- zero stays constant with the squared, waning moon. In practise, this means for haulage it needs an engineer, a fireman and rails with a bar of 48 cm height." "Because of the missing words, the mathematical connection between moon phase and tractive effort is not clear. Also, it is not clear whether the gradient of the railroad track is constant or the solution to this mathematical function has a constant gradient of zero." 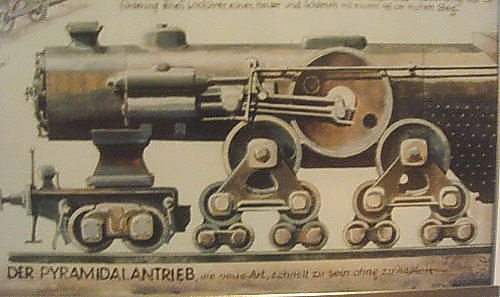 This locomotive does not just have a central cog-wheel, like a normal rack design, but also has teeth on the outside wheels. 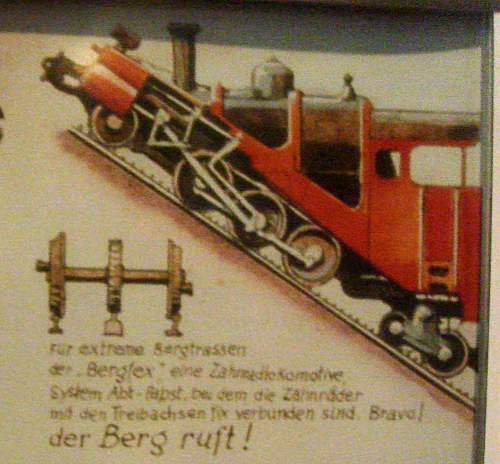 "For extreme mountain tracks - The Bergfex, (or Mountain ghost, a term also used for people with a special affinity to the mountains) a cog wheel locomotive system Abt-Papst, where the cog wheels are fixed to the driving axles. Bravo! Translation of text kindly provided by Roland R�pnack. "The name Abt (which means "abbot") refers to the inventor of the real rack system with two staggered racks. The name Papst (which means "pope") is not known to me in a railway context. It seems to me that Strasser is just making a little play on clerical words here..."
Presumably a triple-rack Papst system outranks a mere double-rack Abt. You can learn more about the Abt rack system at Wikipedia. 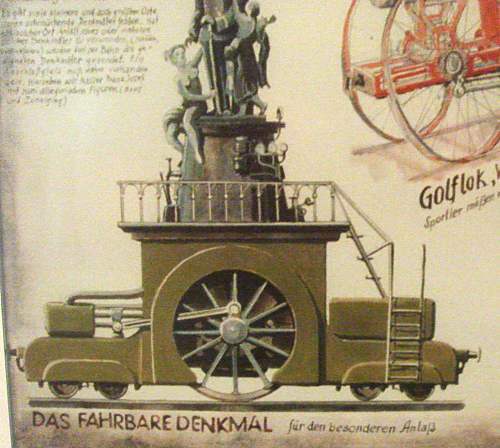 The headline reads: "The very latest novelties in the field of locomotive construction"
In the lower left corner is a complete picture of the mobile-monument engine. Top left is the Springbrunnen or mobile fountain, once again making good use of the vertical-boiler format; the text reads: "The desert lives!". Just below is the red Golflok Windsor subtitled "Sportsmen need not walk". Is this a cryptic reference to the British Royal Family? At top centre there is a blue single-axle drive streamline express loco, under which is written: "What, pray, is this?". Apparently this design is called "The Blue Angel" though what connection, if any, there is with the famous film starring Marlene Dietrich I have no idea. 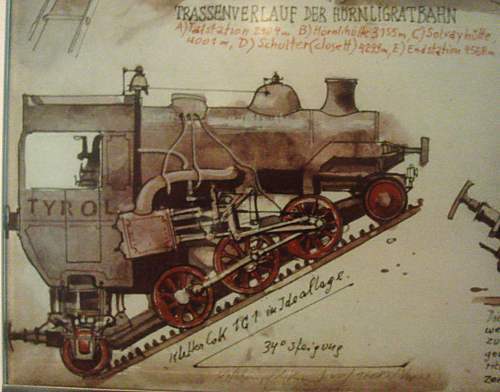 The triple-rack locomotive is at top right. "There are many smaller or bigger townships lacking decorative monuments. If such a town has the occasion to use one or more of such monuments, the appropriate monuments are sent via railway. A connection line must exist, though. Here we see Kaiser Franz Josef, Emperor of Austria, together with two allegorical figures (illegible)and Fondness." NEW: I present here some new Strasser drawings, provided by the artist himself, through the good offices of Lorenzo Ricotti. 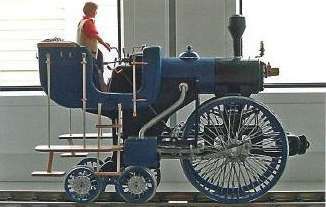 The top title says: "High-wheel fast express locomotive 'Fetzer'". Michael Nicoley tells me that the text at bottom centre translates thus: "The great Reifefetzer" includes the words "Reifen" = Tyre and "Fetzer" = a slang word for someone/something running very fast, followed by "The (steam?) hammer among locomotives". The technical details at bottom right are legible on the original, but do not give the diameter of the driving wheels, which I would have thought was the critical dimension. I seem to recall that a few early locomotives really were designed with the main axle above the boiler. Certainly there was at least one with the axle running through the boiler, the LNWR 2-2-2 3020 Cornwall, designed by Francis Trevithick, son of the great Richard Trevithick. Note the blue streamlined version at the right. This version of "The Blue Angel" seems to have two bogies at the front. 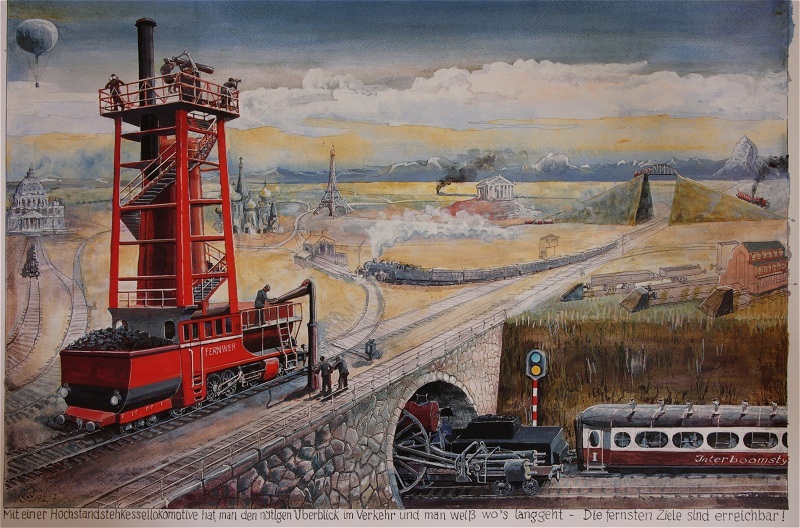 Google translates the title as: "With a high standing locomotive boiler, men have the necessary sight lines for traffic and you know where to go the farthest-" Note the man with the big telescope on top. However the bridge in the distance at the right hints at some of the problems of adopting this form of locomotive construction; the locomotive climbing the bank to it is presumably a rack type. Note that the Eiffel Tower appears in unlikely conjunction with the Acropolis; hinting perhaps that with a high enough boiler you would be able to see all of Europe. When I first saw this drawing I interpreted it as a mobile blast-furnace. Quite what's going under the bridge is not clear, but it is certainly not any sort of conventional locomotive. It might be a version of the "The great Reifefetzer" shown above. Google translates the title as: "The heavy train wreck of Bauxtihaudy", with Bauxtihaudy apparently being an imaginary place-name. Presumably Strasser is highlighting the difficulty of dismantling a tripod of locomotives. Railway workers stroll about nonchalantly under what looks like a less than stable situation. Remarkably, none of the rolling stock appears to have suffered any damage at all. Dear sir, Today I came across your site for the first time in several months, and enjoyed your updates and re-familiarizing myself with the strange and wonderful 'exhibits' within. 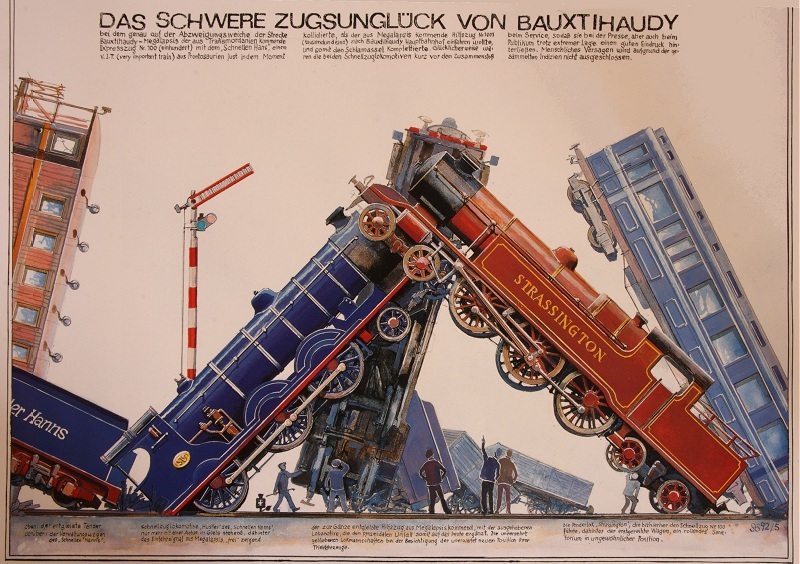 Among them, I found the image entitled "The Heavy Train Wreck of Bauxithaudy", with the, as you described it, amusing tripod of derailed locomotives. What drew my notice was that, despite it being apparently of Swiss or German origin, the image depicted a rather good representation of two pre-Grouping British steam locomotives in the foreground; specifically, the red tank engine being of the "L-Class" of the London, Brighton and South Coast Railway, and the blue tender engine being of the Caledonian Railway's 903-class, commonly known as the "Cardean-class". An unlikely pair of engines to meet it is certain, but humour will not be denied, will it? An HO model of the Blue Angel has been built by Walter Richter, a member of the Modellbahnclub Grieskirchen, who use it as their logo. Here it can be seen that the single driving wheel is enormous, almost twice the height of the cab. Walter Richter has built several other Sigi Strasser models, including the Golflok Windsor shown here. Note that the model has minor differences from the drawing; the chimney is taller (though still impractically short from the point of view of the crew) and the golf bags are not present. Walter has produced some other models based on designs which do not appear in the drawings above. It may not strictly speaking have a Mogul wheel arrangement, but this locomotive is clearly not to be trifled with. In fact it appears to have eight coupled axles, though it's hard to be sure. There look to be 8 bogie wheels under the two-storey cab, so assuming there is a 4-wheel bogie hidden under that fearsome snowplough, the arrangement is 4-16-8, which certainly puts Stalin's Engine, a mere 4-14-4, in its place. Note the tiny figure in the foreground. This behemoth is clearly something like a hundred feet high, not including the fearsome triple-chimney structure. The diameter of the driving wheels must be about 25 feet. It clearly runs on a Very Broad Gauge Indeed, but the track is not visible here so its size cannot be estimated. In Tolkien's fictional universe of Middle-earth, Mordor was the dwelling place of the anti-social wizard Sauron. So far as I am aware it is not recorder as having a railway system. Perhaps we can look forward to "The Lord of the Rings- with the missing railway scenes restored." This superb image was sent to me by one of my many correspondents. At last its origins have been discovered; (I think) it is the cover art for a 1993 computer game called Transarctica which involved combat between huge armoured trains in a post-apocalyptic wasteland. 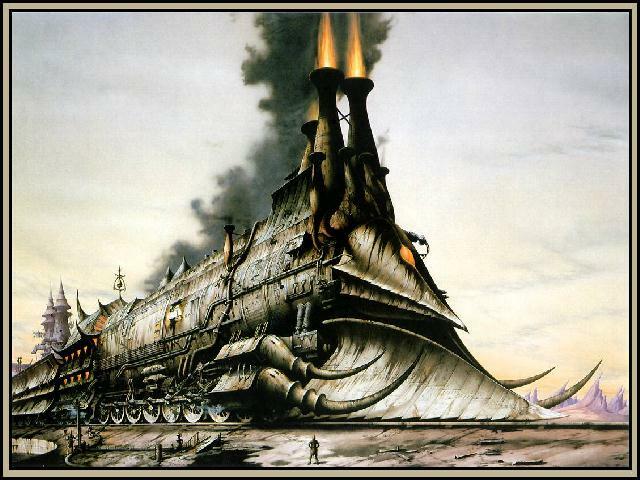 I have also been told the painting was by Rodney Matthews in 1985 and entitled �Heavy Metal Hero�. He allegedly has a web site at www.rodneymatthews.com but it is not currently accessable, so I cannot confirm this. Anyway, a brilliant picture. 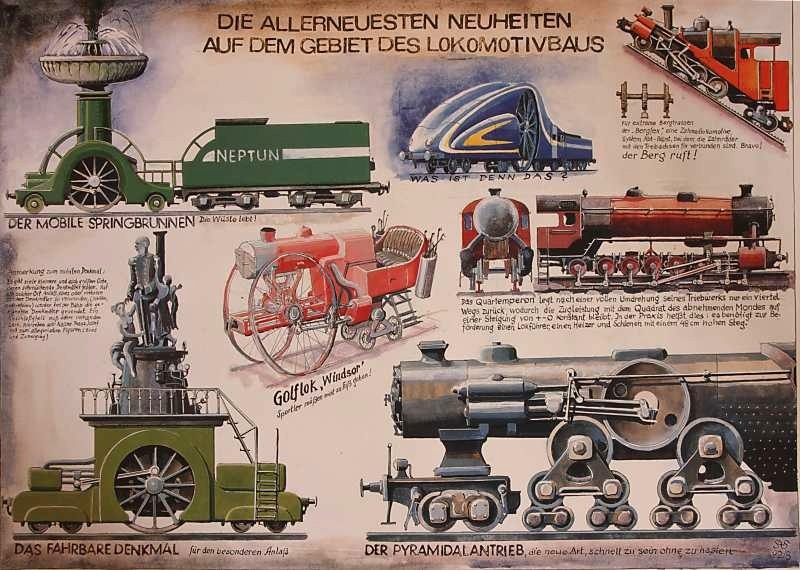 For a wealth of fantasy locomotive designs, see the site of S Berliner. I must admit I find the layout of this site very confusing and I am by no means sure that the above link is the home page for locomotive jollity. Try also here. There is also the Ruhnian State Railway, which could use some work on its navigation, but is otherwise quite brilliant. I finally found the RSR home page. I am not going to mention Thomas the Tank Engine.